Passive distribution boxes are designed to remove any problems associated with complex wiring and make connecting sensors and actuators to the control cabinet easier than ever. In this article, PIF spoke to Murrelektronik about the standout features of their Exact12 Safety passive distribution box, which is specially designed for safe connections. As well as saving time and money with quick installations, passive distribution boxes also offer easy maintenance and a space-saving solution. The Exact12 Safety distribution module is intended for applications where safety is paramount. Featuring eight standard sensor connections, the Exact12 Safety has the capacity for eight additional safe actuators. With all these connections encompassed in one module, you can save space and avoid complex wiring errors. A single home run cable reduces the number of wires going back into the cabinet from eight to one, which means a significantly quicker installation time. The Exact12 Safety also features clear 360° yellow markings, which make it clear to anyone performing maintenance or servicing that this is a safety specific passive distribution box. The Murrelektronik Exact12 safety distribution module meets the safety standard EN ISO 13849-2. This is an endorsement of the fact that failures as a result of other errors within the terminal or connectors are highly unlikely with this passive safety distribution box. Along with this passive safety distribution box’s safety credentials, it also boasts a long service life due to its fully potted and vibration resistant design. It is built with PU moulding to ensure that the connections are sealed and fully resistant to coolants and oil. This type of protection greatly expands the range of applications the Exact12 Safety distribution module can be used for. Exact12 Safety also offers a range of mounting options. 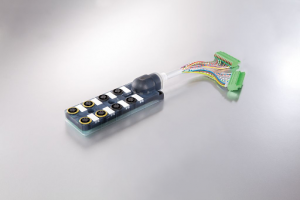 Depending on your application, Murrelektronik can provide a distribution box with a moulded homerun cable, rear mounting, a basic module or a basic module with the addition of a pluggable connection cap. Their engineers can recommend the most suitable design for the demands of your system. Another benefit of the Murrelektronik Exact12 Safety is the cables, which are suitable for C-tracks and come in multiple options. Depending on the demands of your system, choose from a PUR/PVC cable that has 2 million bending cycles or a full PUR cable which offers 5 million cycles. For more information about the Exact12 Safety passive distribution box, contact the Murrelektronik team today.